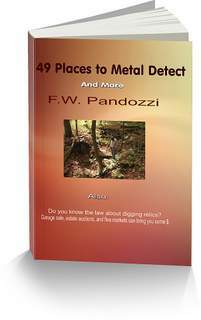 Metal detecting in Massachusetts can be a fun and rewarding experience. There are many areas of historical significance that you can explore. However, be careful of the laws, especially the Federal Law. There have been cases where individuals have been arrested for breaking these laws. Sometimes, people who know they are breaking the law still dig or remove relics, are then caught and arrested. If they have metal detectors, they then bring negative attention to our hobby. Don't Let The Laws Stop You! The Archeological Resources Preservation Act, or ARPA, is the grand-daddy of the laws that protect artifacts. You need to understand what ARPA is. There is also another law that follows on the heels of ARPA. The National Historic Preservation Act. Basically, if you are detecting in Massachusetts, on State Lands, do not dig any item that you believe is older than 100 years. If you want to detect on private property, then be sure you get written permission from the landowner. Metal detecting is allowed on beach and campsite areas with permission of the Park Supervisor. If you want to detect in Massachusetts town, village and city parks, you'll need to check with those local officials. Each of these have their own rules, laws, or ordinances. Do not let the laws scare you from enjoying the hobby. 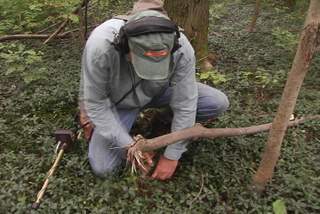 If you are a metal detectorist, or you are thinking of beginning the hobby, but afraid of all the laws and restrictions against the hobby, do not give into the beauracracy. I receive emails from individuals in the hobby who want to park their detectors in the closet and give up. They, like many of us are fed up with the irrational laws that impede our right to enjoy our lands. But I tell them that if you do quit, that means the lawmakers win.And that is exactly what they want us to do. The easy solution is to ask for permission of private property owners. Many of them will allow us to detect their properties. Don't give up metal detecting in Massachusetts! Metal detecting in Massachusetts ghost towns can deliver some exciting finds.